Premier collection of quality pre-owned Rolex watches. Each watch has been serviced by professional watchmakers using only new, genuine Rolex parts, and includes a limited liability warranty, covering full mechanics for two years. 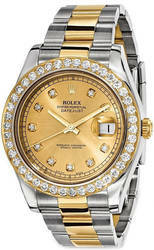 Rolex and the model names mentioned are registered trademarks of Rolex Watch U.S.A. Inc. BillyTheTree, LLC is not an authorized dealer for, nor affiliated with, endorsed or sponsored by, Rolex Watch U.S.A., Inc. or any of its affiliates or subsidiaries.